I know that I made many mistakes with Misha. I realize there are things I should have done differently. Hindsight is 50/50 as they say. When Misha was little she was afraid of water. Not just a bath, but water. She hated the rain, would walk way out of her way to avoid a lawn sprinkle, and tried to flee if someone had on a water house. Don’t even sprinkle water on her! I attempted to bathe her on occasion and it always ended badly. I bought some puppy wipes and used those for a while. They did the job while she was small, but were not a replacement for a real dog bath. I realize now that this is an issue I should have nipped in the bud, but things got so crazy with Misha after my dad died that I was more concerned with other issues like her aggression and her mistrust of people. As with many things with our pets, we pick our battles. Instead battling in the bathtub, I decided to try rinseless shampoos. 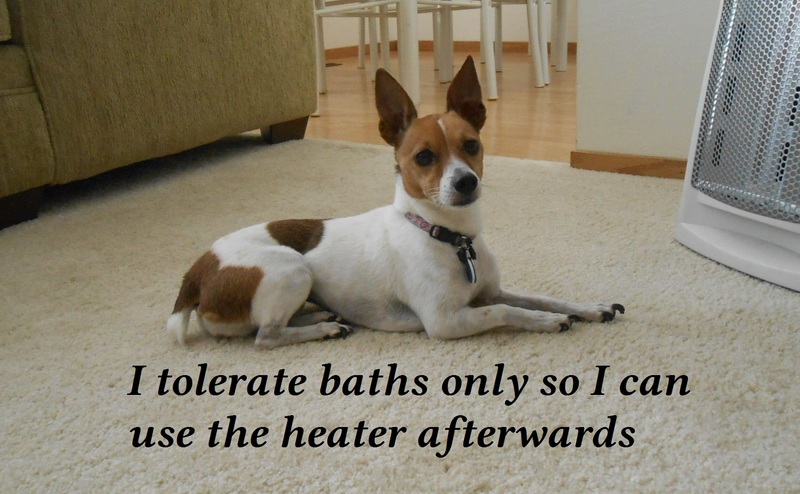 They are designed to get a dog clean without the need to rinse off under water. At first, it wasn’t easy. She fought me every step of the way. Let it be known that I am tenacious (I have the scars to prove it!) and eventually I found a method that worked. 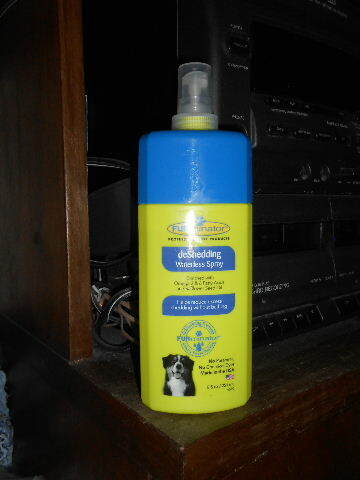 There are a couple of brands of rinseless dog shampoos. Each promising the same thing–a clean dog without the water. I settled on Furminator and have been using it for a couple of years. However, I don’t follow the directions. I have my own method. You are supposed to spray it on the dog, then wipe it off. Why, of course, she is afraid of sprayers! Why do you ask? Instead of spraying, I pour the necessary amount into a small cup. Then, I pour that onto a towel. While holding her, I massage the shampoo into her fur with the towel until she is reasonably wet. Then, I wipe it all off with a towel. She gets lots of attention and a pretty good massage to boot! I give her treats as we go. She has sensitive spots like her right leg (was bitten by a spider once and she never forgot) and her tummy. She earns a treat if she allows me to massage these areas without too much fuss. She loves having her ears and neck massages, so those areas go easy. I’ve heard folks say that Furminator leaves their dog’s fur oily. I have not seen this problem. Maybe it’s because I don’t follow the instructions and I towel her very well so she is fairly dry when done. She comes out very clean. Her white furs is white, her cow spots show through, and she smells good. Perhaps some day we will get through the water issues. For now, I have to make do with what I’ve got. Thanks for this PAWSit Hop theme, Ruthi! Oh, I had to laugh, knowingly, through your anti-water dog, Misha and her baths! My dog Tidbit hated water, snow, anything wet! I did the towel bathing too! Then Tidbit would preen like a cat for hours. Thankfully, the dog I have now loves his bath and playing in water sprinklers and such. Thanks so much for sharing your dog-related article with the PAWSit hop! Ruth, It is always good to know that there are other dogs with the same quirks. It’s great that your current dog doesn’t have those fears. My Lab used to love playing in the sprinklers. She run in and attack the water as it sprayed out. Thanks for including my post in the PAWsit Hop! Aww, what a darling little sweetheart she is. I can just imagine her trembling like crazy with fear. Poor little thing. I’m glad you found a shampoo that works for her. I’d never heard of that product. I came here from the PAWSit Hop, by the way. See you around!